A little cover I whipped up for a flash fiction story I wrote last week. It’s called Repulse and it’s up for voting at The Leighgendarium, Preston Leigh’s blog. He’s had an open call for Flash Fiction for the past couple weeks with some sweet prizes up for grabs. I’m not gonna deny I would like to win, but there are some great stories up on the Flash Fiction Challenge page. What I am going to ask you to do is read through the stories (including mine) and vote with your heart. (and your fingers of course) You can vote for three at a time and you can vote once each day (24 hours). If my story is good enough for your top three, thank you very much. If it isn’t, thanks anyway. Regardless, I plan to include Repulse in a short story collection down the road, so you’ll see it again. It’s been twenty-three years since his home planet was destroyed. A typical day clearing asteroids brings him a life changing message, a voice from the past that he will never forget. Well, what are you waiting for? GO VOTE! Whoa…time got away from me and I forgot to update you guys over here. In the span of one week in the beginning of 2015, I have two stories in two separate anthologies to tell you about. Let’s start with The Powers That Be. Back in early 2014, I was privileged to be in my first anthology — WOOL Gathering. All the stories were centered around Hugh Howey’s WOOL Universe and were penned by authors who had all previously written WOOL stories. It was a fantastic collection that I will forever be proud of. One of the best parts is that all the proceeds will go towards the National Novel Writing Month Young Authors program. So, the authors of LOOW (the League of Original Woolwriters or perhaps the Loofah of Obstinate Wetness) have brought forth another charity anthology — The Powers That Be. It’s already been for sale for a few days and been holding steady on the Kindle Science Fiction Anthology sales charts. Nine stories, all centered around superpowers. Authors are: Ann Christy, WJ Davies, Samuel Peralta, Logan Thomas Snyder, Carol Davis, Thomas Robins, David Adams, Paul K. Swardstrom, and myself. And, I was able to cajole Ernie Lindsey into penning a wonderful Foreword to the book. All great stories, confirmed by the outstanding reviews we’ve received so far. My story is called “To Sacrifice A King,” and deals with the oft-overlooked role of superhero sidekick. A touch of humor, a smattering of pop culture superhero references, and a question: do powers really make a hero? For a limited time, just 99 cents and all proceeds for this book will go towards the Sickle Cell Clinic at Riley Hospital for Children in Indianapolis, Indiana. The price will go up soon, so get your copy before it’s too late. The next book to tell you about is The Alien Chronicles. Throughout the back half of 2014, I watched a few independent anthologies get published — From the Indie Side, Synchronic, The Robot Chronicles & The Telepath Chronicles. After reading the first three and absolutely loving The Robot Chronicles (enough for it to make my top 18 list of 2014), I approached Samuel Peralta about joining in a future installment. He looked over my meager qualifications and invited me to join The Alien Chronicles. To say I was thrilled would be an understatement. But I was also incredibly nervous. These anthologies are showcasing some amazing independent publishing talent and I was going to put my stuff up against theirs and say it’s on the same level. I worked hard to put out the best story I could — ultimately drawing back to my roots visiting my grandmother’s farm growing up. My story is called “Uncle Allen,” and has about the same vibe of my short story Ant Apocalypse. But check out the list of authors joining me: Hugh Freakin’ Howey, B.V. Larson, Jennifer Foehner Wells (her Fluency was on my Top 18 List, too! ), Daniel Arenson, Blair Babylon, Annie Bellet, Peter Cawdron (I love that dude), my good friend and writer WJ Davies, Patrice Fitzgerald, Autumn Kalquist, Moira Katson, Samuel Peralta, Geoffrey Wakeling, and Nicholas Wilson. Foreword by my pal Stefan Bolz. Holy Smokes. Edited by the incredible David Gatewood with a cover by the incomparable Jason Gurley and you have about a perfect package. People are going to love this book. It’s up for pre-order right now and will officially be for sale on Friday, so pick up your copy and get to reading. Between these two books, you can read 24 stories for less than the cost of a Value Meal at McDonald’s. Amazing value for some amazing stories. Then we come to the God in the Machine. Joe Character is lost in space; out of interstellar shipping lanes, alone and drifting with no power and no hope for the future. Along comes Jane Character out of nowhere just in time to save the day! Please. I can’t even begin to calculate the odds! The average distance between stars in our galaxy is about 4 light years. That makes our nearest neighbor, Proxima Centauri, dead average in terms of distance (4.2 light years, if you’re keeping score) but that’s still 4.2(5.87849981 × 1012) miles. I can’t even write that out—I lose track of the zeros. How likely is it you’re going to bump into someone? Fine. Got it. In my writing, I’ve really tried to avoid doing this. I’m sure that if I tried, she would call me on it before I had a chance to hit publish (love ya Ellen!). But…there is a certain writer that I love who uses a Deus Ex Machina in many of his novels, and I LOVE IT. …and these are just the paperbacks on this shelf. I have a few others and a handful of hardbacks too. In a lot of Cussler’s Dirk Pitt books (and a few of his other recent series as well), he has actually inserted HIMSELF as a character. And not just any character, but a seemingly quasi-omnipotent savior. Just like Ellen’s previous example of someone being rescued in the middle of space, our oceans are vast and largely unexplored. Every so often, we hear about a guy who was lost at sea for 6 months or so. How was he out there for so long, undiscovered? Just like that plane from Malaysia was never found – the ocean is ridiculously big. So invariably, Dirk Pitt or one of his other protagonists is facing the end. Cussler has painted himself into a corner and Pitt is seeing the gates of heaven. Suddenly he wakes up on a yacht and a guy named Clive is sipping champagne and talking about just being in the right place at the right time. They talk for a little while and then our protagonist heads on his way. Within a few minutes though, the main characters are already at a loss for the name of their benevolent savior. I was a little dumbfounded when I first read this in one of his books, but now I come to expect it. There is a bit of a “Fourth Wall” effect to it where the author gives the reader a wink and a nod. We all now it’s coming and the characters seem to get a sense of a world beyond their own as well. So…Ellen says Don’t Deus Ex Machina. 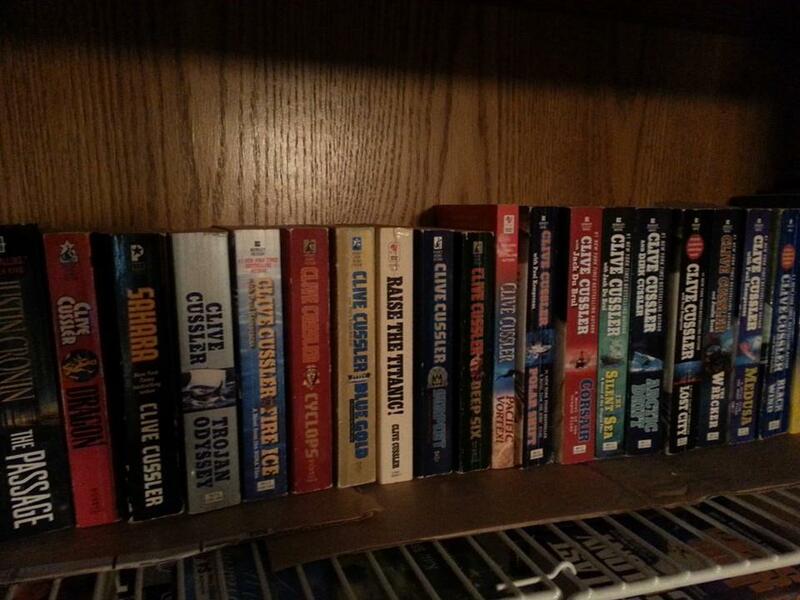 I agree, unless your name is Clive Cussler. Then, by all means – go right ahead. I owe a lot to W.J. Davies. He may not even know it, but he was a huge inspiration when I first started writing last year. Of course, I’ve well-documented my reliance on Hugh Howey and his blog in the early part of 2013 and it was really Hugh’s story that encouraged me to get started with my career in self-publishing. But, it was a blog post by Howey about Davies in January 2013 that propelled me on the course I find myself now. I had been writing my novel, Dead Sleep, for a couple weeks already and had made good progress when I saw Hugh tell about Davies’ WOOL fanfiction story, The Runner. Being a fan of WOOL, I grabbed the Kindle copy and devoured it. I determined pretty soon afterwards that when/if I finished my novel, a WOOL story would be the next thing I wrote as a tribute to Hugh Howey. I think Davies’ connection to my journey is clear from there, but then when I was actively writing The Veil, I got to know Davies on Twitter and found his existing knowledge of publishing and the burgeoning WOOL Universe to be a boon. He was generous and friendly when he could have blown me off as an unknown author. But it isn’t just WOOL fanfiction that has contributed to Davies’ young writing career. His sci-fi series, Binary Cycle, recently wrapped up with a action-packed, killer ending in BC: Skyward. When I was a child, I devoured Isaac Asimov’s books — especially his Robot and Foundation books, which he ended up combining near the end of his life. As I read WJ Davies’ Binary Cycle: Disruption, I found myself going back to those days in junior high and high school, lying on my bed and dreaming of a world different than our own, yet similar in many ways. The world Davies has dreamed up – Taran – is on the brink of disaster. A colony of a dying Earth, it has been left to itself since its founding and planetary forces are threatening its very existence. But, that’s just the foundation for the story as Davies interweaves characters through various places on the planet as these disruptions are having different effects — biological, physical, political — and the characters are all wonderfully crafted to the delight of this reader. I really found myself identifying with the character Jonathas as he navigated a disaster area in search of his girlfriend and the new-found technology recently implanted into his bloodstream. The book ends on a doozy of a note and I am really looking forward to the next installment in this series from Davies. That was July of last year. If there was anything that Davies series suffered from, it was time. He didn’t get Part 2, Revelations, published until early March. He learned his lesson, though, and recently released the conclusion, Skyward, to his series in late May. Revelations continued the stories of the main characters Davies set up in the first part, but Jonathas’ story was noticeably cut short. Not so in the third installment as Jonathas was arguably the main character and hero of the entire series by the time the end of the story came. The four main characters — Jonathas, Cassidy, Skyia, and Reggie — are all brought together as their storylines converged in Skyward with all having a part to play in saving the planet Taran. Again, I really identified with Jonathas, but Davies did a great job developing all the characters so when all their commonalities were laid bare, the reader really feels connected and cares about the outcome of the planet. While the second part of the series is titled Revelations, we get a ton of new revelations in this book, especially early on as we try to put all the pieces in place in the journey to save the planet. The action is taken to a new level and after the early revelations in the book, Davies pushes his characters physically and emotionally, so much that the reader is left panting by the end of the book. In the end, Davies wraps it all nicely, but leaves room for additional tales to be told from Taran, which I would definitely welcome. Binary Cycle proved that W.J. Davies can write outside of the silo and is someone to pay attention to in this new indie publishing world. A few weeks ago, I stumbled upon a book cover for an upcoming release. It was bold, it was daring, it was…straight out of the 1950’s and ’60’s. Back in the Golden Age of Science Fiction, all the book covers had similar vibes. A sense of the unknown mixed with flash and wonder. A robot here or there for effect and some futuristic silver spaceship. And of course, our hero, in a ready-to-act pose and a boyish, yet rogue grin. I was hooked. Book covers aren’t supposed to sell books, I reminded myself as an author. But this one did. I loved the old sci-fi books my dad had on the bookshelf as I was growing up — quick little reads with the promise of so much more. So what book was it? Starship Grifters by Robert Kroese. I hadn’t read any of Kroese’s books before this one, but I think I’ll have to go back and read some now. I was drawn in fairly quickly by the world Kroese built, complete with anti-hero Rex Nihilo. From the get-go the audience is thrust into a well-built story with all the trappings of a fantastic recurring character. After reading Robert Kroese’s Starship Grifters, I came to one conclusion: everyone in the 31st century is an idiot. Rex Nihilo is either the smartest man alive, or a Forrest Gump of a con artist, lucky enough to stay alive in the face of ridiculously deadly circumstances. I’m still not sure — I’ll get back to you on that. At the end of the story, we do get answers to questions I wasn’t sure we were asking, but it certainly paved the way for more Rex Nihilo books, which I will gladly shell out money for whenever Mr. Kroese decides to write them. Today we are blessed with Part 3 in Robins’ ambitious tale, ready for download on Kindle. I was lucky enough to be an early reader of DTE3, and I have to say: Robins steps up the story to another level I didn’t know he had in him. So what’s the story with DTE? Basically, DTE tells the story of a young woman named Ineeka from inner-city Chicago. As a reader, we see two stories told in parallel tracks — one is Ineeka’s quest to escape from Chicago, from her past, from her nature, from what could have been her destiny. The alternate story is of Ineeka as an astronaut, taking a passenger to the International Space Station and the unexpected adventure that follows in orbit of Earth. Ineeka was so desperate to escape her life on Earth, that she wound up leaving the planet entirely. From there Robins does an exceptional job following Ineeka as she battles her figurative demons back on Earth and the literal enemies she has once she reaches the ISS. With each new addition to the story, Robins amps up the drama and the action as his skill as a writer continues to improve. I think a lot of people can really relate to Ineeka’s situation. Her mistakes from her adolescence threaten to ground her from NASA before she even has a chance. She dreams of flying…away from Chicago and her life there. It would be easy for her to stay. It would be the well-worn path taken by so many young women, not just in the inner city, but all over this country. I see it myself in rural Illinois. Girls latch on to a guy. They don’t work as hard in school because they think they can just depend on Mr. Good Ol’ Boy the rest of their lives. (Maybe they can, maybe they can’t — that isn’t the point.) They mentally hit stop on their education and any dreams they may have had and slide into a sense of apathy. They stay within 15 miles of their high school most of their lives and by the time they reach middle age, they wonder what happened to their childhood hopes and dreams. Ineeka is not that girl. She is strong and confident. Even with every obstacle and hurdle in her way, she manages to make her dreams come true. It may not come in the traditional way, but just as her name suggests, Ineeka is not the traditional girl. As Robins takes us from the peril the entire world is in at the end of Part 3, it will take that tenaciousness for Ineeka and the rest of the human race to survive Part 4. Robins has gotten a lot of compliments on his portrayal of the Earthside story through Parts 1 and 2, but his spaceside story in Part 3 holds its own. I kept rushing through Ineeka’s Earth struggles to get back to her issues in space. If you haven’t yet checked out Thomas Robins’ Desperate to Escape, here is Part 1, and Part 2, and finally, Part 3. All just 99 cents with Part 4 destined for your Kindle this summer. Get this book — you won’t regret it.